Curling Iron Sizes & Types - What Should I Use? Curling Iron Sizes & Types – What Should I Use? We think it’s safe to wager that most women out there have chosen their hairstyling tools through years and years of trial and error…and with their own hair as the guinea pig. If you can relate (really, who can’t? ), then look no further. We know how difficult it can be to find the perfect curling iron sizes for your desired hairdo. 2 What Size Curling Iron is Best for You? What Size Curling Iron is Best for You? So what exactly do each of these barrel sizes do or what size curling iron is best for you? Check out this breakdown from your largest to your smallest options. This one doesn’t curl so much as wave or simply round the ends of your hair inward. If you don’t have a round brush or your blow-dry didn’t achieve the look you wanted, this is excellent for a touchup. The best choice for big curls and big volume. Hold each curl a little longer and pin-up when finished until completely cool so that these curls last longer. One of the more popular choices. It’s right down the middle. Just like Goldilocks, it won’t feel too big or too small, but “juuuust right”. This will give you a similar curl to the 1 ¼ inch iron, but better if you have shoulder length or shorter hair. For those with longer hair, it will appear to be a tighter curl. A tighter curl, naturally. It’s excellent for hair that’s pulled up because it will curl both your hair in the updo and give a gentle wave to the strands that frame your face. This is perfect for girls with already naturally curly hair. It helps to put the finishing touches on those flyaways. It’s teeny tiny and is very specialized for either ladies with tight curls or younger girls, and definitely only for those with short ‘dos. Need help choosing the best brands of curling irons? These 3 get our vote for the best irons in varying curling barrel sizes. 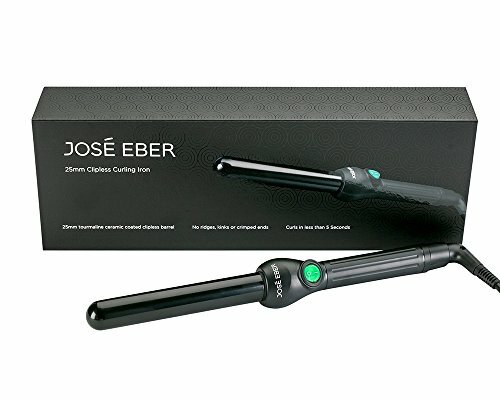 At just under 1 inch in barrel size, this 25mm curling iron is perfect for a variety of hair types and curl sizes. If you’re not sure whether to choose a smaller or larger curling iron, this is the happy medium. It is incredibly lightweight with aluminum-coated ceramic barrels. This means it gets really hot but stays hot throughout. There is one singular heat setting, which takes the guesswork out of choosing your temperature. Because it does reach such high heat, though, make sure to use the included heat-protecting glove and take care when curling near your face and neck. Put the glove on the hand that holds your hair. Choose a smaller section of hair for thinner, beachy curls or a thick section for glamorous waves. With the barrel positioned vertically, spiral your hair from root to tip. Hold 2-5 seconds. Release your hair and simply let it slide out. 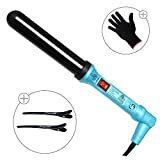 This is a great product for first-timers to the world of clipless curling irons, and as soon as you get the hang of it, you probably won’t even need the glove. You’ll just curl and go, and at the end of the day, you’ll still be looking fabulous. Sometimes that extra quarter of an inch makes all the difference, doesn’t it? This 32mm curling iron is roughly 1.25 inches, which is the best option for achieving a slightly bigger curl (but not too big), especially if your hair is longer than shoulder-length. The extra long barrel is straight and not tapered, which gives each curl or wave a uniform look from root to tip. The ceramic barrel heats quickly and hot, with one temperature setting, and maintains even heat throughout the barrel the entire time you curl. The non-stick feature makes it easier for the hair to hold as you wrap it. Likewise, the handle is easy to grip with a swivel cord. You will enjoy absolutely no tangles to your hair with this iron! At 1.7 pounds, this curling iron is heavy duty and a bit more substantial. It features a long life heating element that will give you solid curls for many years to come. Though there is no auto shut-off mechanism, there is a safety on/off switch with light. Still, take extra care to unplug it after each use. If you’ve been using 1 or 1.25-inch traditional curling irons for a while now, it’s time to give this iron a try. It makes perfect, frizz-free curls with a slightly looser and more glamorous look. And it’s super easy and quick to use. 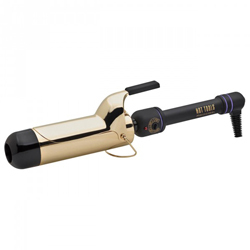 This is one of the largest curling iron and is truly meant for those with longer hair. If you have super long hair, this is perfect for large voluminous waves that stay soft and curly without losing any of that volume throughout the day. If you have basic long hair and up to shoulder length, this 2-inch iron is to perfectly curl in the ends of your hair when your blowout doesn’t look quite right. It sure does look luxurious with its 24K gold-plated barrel, but even better, it uses Pulse Technology, which means that it gets hot and stays hot all over. And by hot, we mean hot! The temperature is adjustable and goes up to a pro setting of 430F. Any heat loss is quickly restored by the unit itself with its rheostat control. Due to this high heat, practice by starting on a lower setting first and gradually move up to the professional setting as needed. You will probably find yourself using daily heat in the 300s range. It also features an easy-grip handle, the 8-foot cord that won’t tangle, one-year warranty, and a folding safety stand. One of the best features is the 2 replacement springs just in case you pop one over time. It happens to the best of us with regular curling iron use, but its an easy fix without losing the most important part – the heat and curl. Large voluminous curls, a head full of great spirals, a vintage classy look, beachy waves, updos and down – the tiniest change in curling iron sizes can make all the difference in how you look and how you feel. These three products are the absolute best to get you that curly look you want. We’ve shopped around for you. All you have to do is check them out on Amazon for yourself and have fun playing with your style!